Several years ago a friend of mine asked me how many different species of birds had I seen in my lifetime (usually described as “lifers”). I answered that I did not know. Then, I was asked how many different birds had I seen in my yard. Again, I answered that I did not know. Shortly after that, I went to my bird book and counted them up. I do not remember what the totals were then, but at present I have seen 527 (a small number by birding standards) with 126 of those from our yard. Of the backyard variety, 93 were actually perched in our yard and another 33 were seen flying overhead. We were fortunate enough to have had 10 different species nest in our yard, several of which nested more than once. Most people are surprised by the number of birds that come into our yards. This winter, I periodically sent pictures with accompanying articles from Arizona to friends and family via email. I was hoping that I would not bore them to death, but to my surprise, I was encouraged to send more and more often. After that experience, I decided that I would try my hand at writing articles, complete with pictures, for the local newspaper. The pictures have been taken and developed by myself. Because there are so many bird books available, I will present only brief descriptions. Rather, I will attempt to present more subjective descriptions that, hopefully, will help beginners identify birds in their back yards. At this time of year our yards are full of transients that can be seen only in the spring and fall as the birds migrate from their wintering grounds in the south to their nesting sites in the boreal forests and tundra of the north. The first several issues will treat the birds in this category. 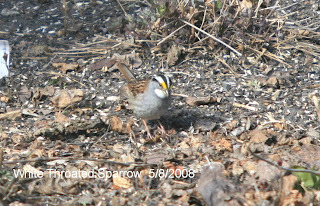 In this first issue I am focusing (no pun intended) on the White Throated Sparrow. This bird feeds and nests on the ground, but sings and roosts in trees, which is common to most sparrows. It can usually be seen scratching in leaf litter looking for seeds. Unlike chickens that scratch one foot at a time most small scratching birds use both feet simultaneously. Its song is a very distinctive series of whistles that some people have interpreted as “poor Bill Peabody, Peabody, Peabody”. Even though it can be heard locally in spring, but to get the real feeling for its song, one should go to its nearest nesting site at Greenwater Lake. However, one should be prepared to be frustrated in locating the bird as it can be quite ventriloquial. The White Throat can be readily recognized by the longitudinal black and white stripes on its head, white throat and bright yellow at the base of its dark beak. Like all sparrows males and females are identical. Be careful in identifying this bird as it can be quite easily confused with its close relative, the White Crowned Sparrow, that also has a black and white striped head! Enjoy finding the differences.